Over the summer, I met a lady from southern Germany who had found herself on the receiving end of some vibrant multicultural outreach from one of Mutti Merkel's boy charmers. As a result, she no longer goes out after dark. She had also decided - with reluctance, because she enjoyed it - to cancel her participation in a local Christmas market, where she'd sung carols every year - in broad daylight. "Because it's Christmas," she said, "and I'm worried Christmas will be a target." A young boy tried to set off a nail bomb at a Christmas market in Ludwigshafen, but the device failed to detonate, prosecutors have confirmed. 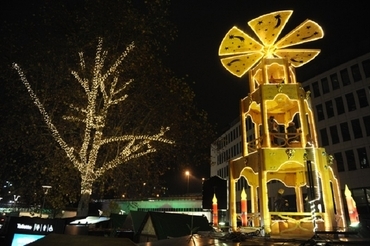 The boy, a German citizen of Iraqi heritage, attempted to blow up the device at the Ludwigshafen Christmas market on November 26th. When the device failed to detonate he gave up, before trying again on December 5th, prosecutors said on Friday. This time he took the explosive device, hidden in a rucksack filled with nails, and placed it in a bush near the town hall. Fortunately a pedestrian spotted the bag and alerted police, who then had specialists carry out a controlled explosion, Focus magazine reported on Thursday, citing security sources. Christmas markets are a grand German tradition, but probably not for much longer. I wake up to stories like this every morning, and I can't write about them all, not least because they're like a catalogue song, like "You're The Top" or "These Foolish Things", an endless accumulation of examples that all go to prove the same point - in the case of Germany, that "You're The Pits" or that "These Foolish Things (remind me you're screwed)". What is there to say? This twelve-year-old boy was born in Rhineland-Palatinate, so these are his neighbors he wants to blow up. He is, as the media now say, a "homegrown terrorist". So the commentariat argue that it's nothing to do with refugees or immigration, because after all he's German born and bred. I've been writing for 15 years about generational disassimilation: there's a passage on the intensifying radicalization of second- and third-generation Muslim families in America Alone, which would make a lovely Christmas gift for German readers too scared to visit the local market. Instead, in service of the multicultural illusion, the press insist that, as the kid was born here, it can't be Islam that's to blame but Germany. Also on Thursday, prosecutors announced the arrest of a Tunisian man suspected of planning an unspecified mission for the Isis jihadist group. The 24-year-old identified only as Charfeddine T. had joined Isis before he arrived in Germany in October 2015, the prosecutors' statement said. As I said, this is now just the world's longest catalogue song. Eagle-eyed passersby are all that stand between German Christmas shoppers and a nail bomb. Who wants to live like that? Everyone in the western world, apparently, because very few "mainstream" politicians ask the obvious question - is mass Muslim immigration worth it? - and the non-"mainstream" ones who do, get dragged into court and convicted of thought-crime, like Geert Wilders. Enjoy the internal contradictions of "diversity" while you can. Diversity, for Berlin gays as for Paris women, is mere prelude to ruthless uniformity. Many in Freiburg, and also across the country, feel that the murder of the young student also marked the death of an ideal -- that foreigners wouldn't have any trouble adapting here and that there were no serious hurdles to prevent integration. That's not an "ideal", that's a delusion. It's striking to a non-German reader that, under the country's unusually onerous reporting restrictions, both the victim and the perpetrator can only be referred to by their first names and initials. The deceased's name is Maria Ladenburger, but it never appears in Der Spiegel's account, and the effect is that she seems like a mere bit-player in her own murder. You'd almost get the impression that the death of a young woman is less important than "the death of an ideal". With a tweet here and a tweet there, and with a reliably hair-trigger hysteria from the press only 140 characters away, Trump is happily driving a wedge between the news media and their intended customers. As if they weren't already unpopular enough! The dawning Trump era is pushing the mainstream press further and further to the margins of the conversation Americans think is worth paying attention to. Their bizarre preoccupations this last week confirm that judgment. Meanwhile, in this interregnum before the Trump era formally dawns, he's being unusually energetic for a mere executive-in-waiting. I wouldn't be surprised if he "nominates" his replacement for Scalia before the inauguration. Sorry about that, Daniel, but it still made my day. On an album of cat songs there are certain things you have to include - "What's New, Pussycat? ", "The Siamese Cat Song", "I Tawt I Taw A Puddy Tat" - but "Chase Me, Charlie" was just for me. It's a sweet waltz, yet, as Mr Vaught is discovering, oddly insinuating. Whether your taste runs to that or "Cat Scratch Fever", if you need a stocking-stuffer for the cat-fancier in your family, Feline Groovy is available on CD - and, if you can't wait for the mailman, it can be yours in seconds via digital download from Amazon or iTunes.